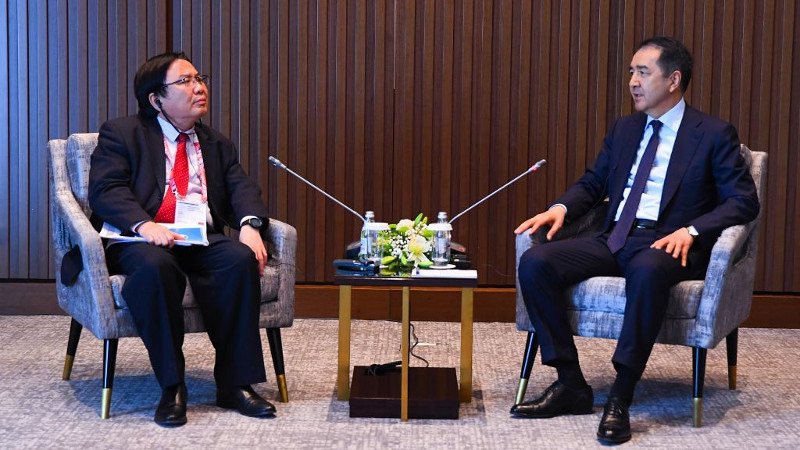 AKIPRESS.COM - Asian Development Bank (ADB) Vice-President Mr. Wencai Zhang reaffirmed ADB’s strong development partnership with Kazakhstan during his 3-day visit to the country which concluded, the ADB said. Mr. Zhang held meetings with Kazakhstan Prime Minister Mr. Bakytzhan Sagintayev and other senior government officials to discuss Kazakh and global economic prospects as well as the new Central Asian trade agenda at the 11th Astana Economic Forum held on 17-19 May. As part of the trip, Mr. Zhang participated in the Central Asian Regional Economic Cooperation (CAREC) Forum organized by ADB, the International Monetary Fund, and the World Bank. Participants discussed lessons learned from the experience of implementing countercyclical policies in response to the external economic shocks that hit Central Asia in 2014–2015. Mr. Zhang, who is responsible for ADB’s operations in Central, West, and South Asia, also met with Deputy Prime Minister and Minister of Agriculture Mr. Umirzak Shukeyev, Deputy Prime Minister Mr. Erbolat Dossaev, Minister of National Economy and ADB Governor for Kazakhstan Mr. Timur Suleimenov, Minister of Finance Mr. Bakhyt Sultanov, and other high-level officials. During the meetings, Mr. Zhang discussed ADB’s ongoing and planned operations in Kazakhstan under the ongoing country partnership strategy, reaffirmed ADB’s strong partnership with the country, and expressed commitment to further support the country’s economic development. “For more than two decades, Kazakhstan and ADB have worked together to bring prosperity to the people of Kazakhstan. We hope to strengthen our partnership further by investing in transport, energy, agriculture, urban, social and finance sectors, and by developing knowledge partnerships and innovative financing approaches,” said Mr. Zhang. ADB’s current operations in Kazakhstan are helping diversify the economy, strengthen inclusive and sustainable growth, foster private sector development, and deliver knowledge products and services in support of the government’s development strategy. ADB is also working with the government and other development partners to promote cross-border links through the CAREC program. While addressing the participants of the CAREC session at the Astana Economic Forum, Mr. Zhang noted the importance of strengthening regional cooperation for helping Kazakhstan and other Central Asian economies realize their growth potential and highlighted the need for regional infrastructure development to promote connectivity and trade in the region. Over the past 17 years, CAREC has grown from 6 transport projects worth $247 million to 185 projects with total investments worth more than $31 billion. A new CAREC 2030 strategy introduced last year opens additional opportunities in water, agriculture, health, education, and tourism. Since joining ADB in 1994, Kazakhstan has received over $5 billion in sovereign and nonsovereign loans, guarantees, and technical assistance for agriculture and irrigation, education, finance, transport, energy, water supply, and sanitation.